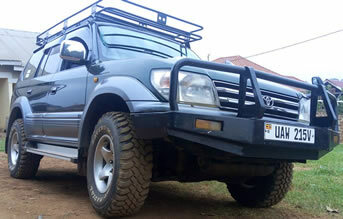 We deliver rental cars anywhere in Uganda and Rwanda (Terms and Conditions apply). Delivery to the airport and to most hotels is free. Renters may return vehicle to our office or have it picked up from their hotels or Airport. Driving License/ Who May Rent the Car? 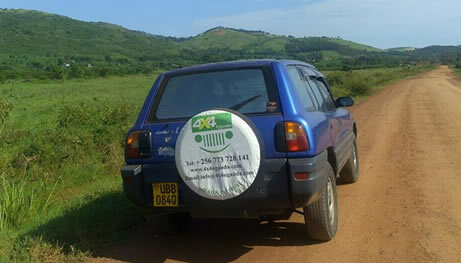 A valid driving license from the country of residence or an international driving permit is required for self drive car hire with 4×4 Uganda Ltd. The hirer must be over 20 – 70 years of age and have held a valid driving license for a minimum of 2 years. He must also be in possession of proper means of identification other than a driving license. The company reserve the right not to rent to any person it sees fit. Persons desiring to drive the vehicle must be authorized by the company and recorded on the rental agreement. The qualification requirements of an additional driver are the same as those for the renter (see above, – Who may rent vehicles?). If the car found driven by an unauthorized person, then all protections and insurance provided under the agreement are voided. Upon confirming the vehicle required, at least 30% deposit required paid by Visa or Master card or by Paypal. The balance is paid on the day you are picking the vehicle. All our vehicles are comprehensively insured. Loss/damage of tyres / tires, tools and windscreens/glasses are not covered by insurance. The quotation for self drive car hire includes comprehensive car insurance cover, Unlimited mileage, 24 hour road assistance and Taxes. The vehicle must be locked when unattended. The Hirer is responsible for the security of vehicle. The Hirer must not carry passengers for reward or gain. The hirer should not drive at night beyond 6:30pm. Cars hired for self drive are subject to the Company’s standard form of agreement. Notwithstanding the above conditions the Company reserves the right to refuse a hire at any time without assigning any reasons. Self drive rates exclude Fuel / Gas and Oil. Whereas our rental cars are well maintained and regularly serviced, sometimes things may go wrong. We operate a 24-hour support service, just a telephone call away, we respond promptly. PLEASE DO NOT ATTEMPT to repair the vehicle. The renter may not effect any repair on the vehicle unless authorized by the company to do so. The rental day is normally considered 24 hours after the vehicle is delivered to the renter. All accidents must be reported. In case of an accident, the renter is required to obtain data from the other party/parties (license #, Name, Insurance Company, telephone numbers etc) and then call our company immediately. The renter should not leave the scene until the police and/or one of our agents appear at the scene. The renter also agrees that he/she will assist the company in completing a formal report for the insurance company.